12.1. A geyser heats water flowing at the rate of 3.0 litres per minute from 27 °C to 77 °C. If the geyser operates on a gas burner, what is the rate of consumption of the fuel if its heat of combustion is 4.0 × 104 J/g? Water is flowing at a rate of 3.0 litre/min. The geyser heats the water, raising the temperature from 27°C to 77°C. ∴ Rate of consumption = 6.3 × 105 / (4 × 104) = 15.75 g/min. Therefore, the amount of heat to be supplied is 933.38 J. (a) Two bodies at different temperatures T1 and T2 if brought in thermal contact do not necessarily settle to the mean temperature (T1 + T2)/2. (b) The coolant in a chemical or a nuclear plant (i.e., the liquid used to prevent the different parts of a plant from getting too hot) should have high specific heat. (c) Air pressure in a car tyre increases during driving. (d) The climate of a harbour town is more temperate than that of a town in a desert at the same latitude. (a) In thermal contact, heat flows from the body at higher temprature to the body at lower temprature till tempratures becomes equal. The final temprature can be the mean temprature (T1 + T2)/2only when thermal capicities of the two bodies are equal. (b) This is bcause heat absorbed by a substance is directly proportional to the specific heat of the substance. (c) During driving, the temprature of air inside the tyre increases due to moion. Accordingto Charle's law, P ∝ T. Therefore, air pressure inside the tyre increases. (d) This is because in a harbour town, the relative humidity is more than in a desert town. hence, the climate of a harbour town is without extremes of hot and cold. 12.4. A cylinder with a movable piston contains 3 moles of hydrogen at standard temperature and pressure. The walls of the cylinder are made of a heat insulator, and the piston is insulated by having a pile of sand on it. By what factor does the pressure of the gas increase if the gas is compressed to half its original volume? The cylinder is completely insulated from its surroundings. As a result, no heat is exchanged between the system (cylinder) and its surroundings. Thus, the process is adiabatic. The final volume is compressed to half of its initial volume. Hence, the pressure increases by a factor of 2.639. The work done (W) on the system while the gas changes from state A to state B is 22.3 J. This is an adiabatic process. Hence, change in heat is zero. Therefore, 16.88 J of work is done by the system. 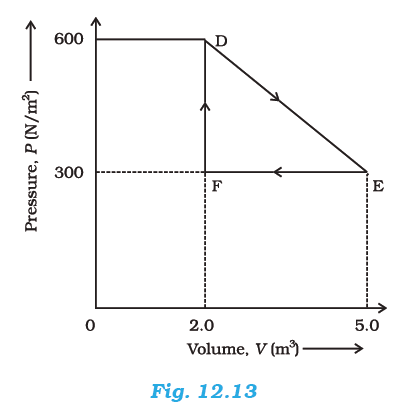 (a) What is the final pressure of the gas in A and B? (b) What is the change in internal energy of the gas? (c) What is the change in the temperature of the gas? (d) Do the intermediate states of the system (before settling to the final equilibrium state) lie on its P-V-T surface? (a) When the stopcock is suddenly opened, the volume available to the gas at 1 atmospheric pressure will become two times. Therefore, pressure will decrease to one-half, i.e., 0.5 atmosphere. (b) There will be no change in the internal energy of the gas as no work is done on/by the gas. (c) Since no work is being done by the gas during the expansion of the gas, the temperature of the gas will not change at all. (d) No, because the process called free expansion is rapid and cannot be controlled. the intermediate states are non-equilibrium states and do not satisfy the gas equation. In due course, the gas does return to an equilibrium state. 12.7. A steam engine delivers 5.4×108 J of work per minute and services 3.6 × 109 J of heat per minute from its boiler. What is the efficiency of the engine? How much heat is wasted per minute? Hence, the percentage efficiency of the engine is 15 %. Therefore, the amount of heat wasted per minute is 3.06 × 109 J. 12.8.An electric heater supplies heat to a system at a rate of 100W. If system performs work at a rate of 75 Joules per second. At what rate is the internal energy increasing? Heat is supplied to the system at a rate of 100 W.
The system performs at a rate of 75 J/s. Therefore, the internal energy of the given electric heater increases at a rate of 25 W.
12.9. A thermodynamic system is taken from an original state to an intermediate state by the linear process shown in Fig. (12.13). Its volume is then reduced to the original value from E to F by an isobaric process. Calculate the total work done by the gas from D to E to F.
Therefore, the total work done by the gas from D to E to F is 450 J. 12.10. A refrigerator is to maintain eatables kept inside at 9°C. If room temperature is 36° C, calculate the coefficient of performance. Therefore, the coefficient of performance of the given refrigerator is 10.44.